PRESS RELEASE: Squier Guitars are extremely proud to release details of the Biffy Clyro Signature models. The instruments designed in collaboration with Simon Neil and James Johnston from the band will be available from 20 October 20 2009 in Europe only. 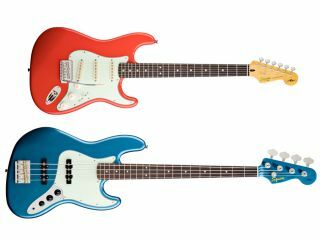 The Squier Simon Neil Signature Stratocaster (£359.99) and the Squier James Johnston Jazz Bass (£419.99) are based on their number one instruments. The Stratocaster is colour matched to Simon's '60s Fender Custom Shop Stratocaster and features a custom set of pickups which are a blend of Alnico III & V magnets - Giving classic Biffy Stratocaster tones with great clarity and a full-sounding bridge pickup. The Squier James Johnston Jazz Bass features a Lake Placid blue finish with matching headstock features a modern radius neck with medium jumbo frets and a set of Custom Jazz Bass Single-Coil Pickups. Both guitars feature a Biffy Clyro logo on the front of the Headstock and the guys' signatures on the back of their respective instruments, both instruments have made appearances on the bands' recent live dates. Formed by Simon Neil (guitar/vocals) and twins James Johnston (bass/vocals), and Ben Johnston (drums/vocals) in the mid '90s, Scottish alternative rock band Biffy Clyro have been entering into the hearts of rock fans all over the globe. Biffy Clyro are known for complex and interwoven guitar riffs, chord sequences and melodies, and an intense, exciting live show. With the release of Puzzle in 2007 the band gained mainstream success, reaching number two in the UK album charts and a string of successful singles. In July 2008, the band released a new single entitled Mountains, which reached number five in the UK Singles Chart and are about to release the highly anticipated album Only Revolutions on 14th Floor Records.